Over three months after the end of the Tour de France, Mark Cavendish is still frustrated by the thoughts of what might have been in the race. The Manxman clocked up three stage wins but was unable to match his haul of previous years: four in 2008, six in 2009, five in both 2010 and 2011, plus the Maillot Vert in the latter. The Manx rider competed with the Sky Procycling team this year and, unlike other Tours where he had dedicated sprint support, had little backing due to the team’s focus on Bradley Wiggins’ bid to win overall. And while Wiggins succeeded in the latter goal, something that Cavendish states brought him a degree of satisfaction, he nevertheless rues the missed personal opportunity to further increase his stage-winning haul. “It wasn’t a failure, and I was very proud to be part of a British yellow-jersey winning team with Brad, but it wasn’t the ultimate either,” he told the Daily Telegraph. “We didn’t achieve what I thought we were setting out to achieve at the start of the season. “I always set the bar high. Chris Froome could have won two more stages, I should have won another two and Sky should have taken both jerseys. We could have done that without any risk or detriment to the yellow jersey. With Wiggins and Froome both aiming for Grand Tour success next season, Cavendish has accepted that he will never get the same support at Sky as he did with the HTC Highroad setup. As a result he negotiated an early exit from his three year contract, and will compete instead for the Omega Pharma Quick Step team next season. He will be reunited with several familiar faces there, including former team-mates such as Tony Martin, plus Brian Holm and Rolf Aldag on the management side of things. Holm spoke recently about their future reunion, telling VeloNation’s Xylon van Eyck that he was looking forward to teaming up once more. 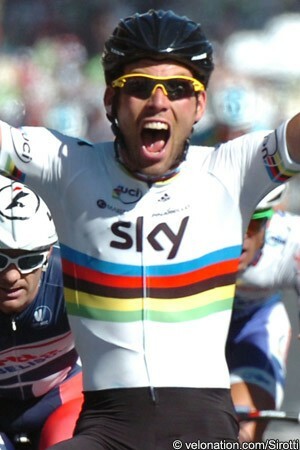 “I am both happy and proud to work with Cav again,” he said. “I believe Cav is one of the few true champions of cycling. He rides clean, has a big mouth, wins and he dresses well. Cavendish wants to continue working towards what would be the absolute record of Tour stage wins, and also wants to take more green jerseys. He’s accepted as the best sprinter of his generation and he wants to fully exploit his speed in the years to come. He’ll also hope to take Olympic gold before he retires, be it on road or track. He is yet to take a medal in the Games, and missed out this year when his British cycling team-mates were overwhelmed by the other teams on the London circuit. British support proved to be enough for him to take world championship gold just over a year ago, but with smaller teams in the Games, he states that he fully accepts the way things turned out. All in all, he’s satisfied which the fifteen wins he clocked up in 2012. It’s less than he did in other seasons, but given that he had the pressure of being world champion plus less team support at times, he accepts the haul.